I admit, I’ve ridden on the social notion of stereotyping women to be less expert on what is supposed-to-be man's job – tinkering computers, electronics, fixing sinks and to a larger scheme of things engineering, making houses, landscaping and etc, the reason maybe why the term use to address this refers to a man. Oh, well, women have taken advantage with this; I would address it as a privilege rather than a handicap having to call men always to do this kind of jobs. Not that we can’t do it, but we’re used to having handy man around. Like for instance, if you hire a handy pro right now, you don’t have to travel far to finding them you just have to visit Hire-a-pro.com and post a job you want to get done with specs and your budget, leave it as it is you can shop around and come back with the result. That easy! Their system works simply, post a job, professionals in your area of requirement bid, and then you approve which portfolio you think have the best skill to the job for you. I also find this system very helpful to construction industry; imagine companies saving a lot of resources by finding construction leads online and legitimate at that. Awesome! So ladies out there drop all those hammers and pumps, get yourself a pedi and a mani instead, let Mr. Handy do the workie, OK! 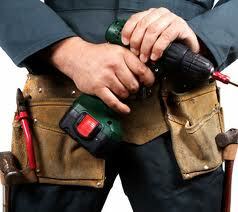 We really do need handy tools for construction purposes because of its comfortableness and easy to use design.